FREE UK delivery applies to everything (no minimum spend). Please note that 24hr delivery applies to "In Stock" items only ordered before 2pm. Items showing as "Available" with a standard lead time will be dispatched as indicated (e.g. within 2-3 days). In stock orders placed after 2pm will be shipped the following working day. Free next day delivery does not include delivery on Saturdays. We can arrange Saturday delivery for £10 per box and also have options for Sunday delivery and same day delivery (please call to order). Which courier? In order to offer FREE delivery to UK customers, we use several premium couriers to ensure your delivery arrives safe. Most large orders (over 2kg) ship using DPD or TNT courier and smaller orders (under 2kg) by Royal Mail signed for services. The most appropriate courier will be chosen for the items ordered to ensure the quickest possible delivery. Deliveries to Ireland? Any order under 0.9kg in weight will be charged at £4.99 (ships by Royal Mail), any order 0.9kg or over will be charged at £9.99 (ships by courier). UK Tracking Details? We confirm when your order ships by e-mail, with a separate e-mail to confirm tracking details (between 16:00 and 18:00 GMT). If you do not receive tracking details by 18:00, please check your e-mail "junk" folder. You can use these tracking number to check order tracking. Most shipped items arrive the next working day. Please allow upto 3 working days for deliveries to highlands, Isle of Man and Ireland. We confirm when your order shops by e-mail, with a separate e-mail to confirm tracking details (between 16:00 and 18:00 GMT). If you do not receive tracking details by 18:00, please check your e-mail "junk" folder. You can then use the tracking number to check order tracking. Please allow upto 5-7 working days for delivery to Europe and upto 5-10 working days for delivery outside of Europe. If there are any delays due to customs regulations, etc, you will be contacted by Audio Affair or by the courier with a request for the information required. Customs duties do not apply for shipments into any EU country (for a full list please refer to the EU Country List). Customs duties apply for countries outside of the EU. Customers in these countries are responsible for all taxes and duties incurred when the order enters your country. If you do not receive your order within 5 working days after receiving your shipping confirmation, please contact the courier with the tracking information provided to check if your order is being held. If you do not have tracking information, please contact shipping@audioaffair.co.uk for tracking details. If your order is kept by the courier, not collected and then returned to us, there is a charge for redelivery, so please ensure you contact the courier if you receive a missed delivery slip. 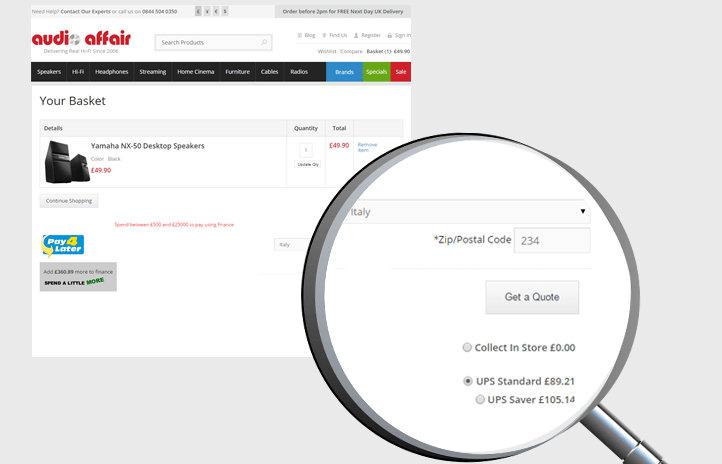 When we despatch your order, you will receive a shipment confirmation e-mail containing a tracking number. We use DPD for all UK deliveries, you will also get a text message with one hour window before your delivery. We also use UPS for all international deliveries. Check tracking below by clicking the courier name. Make sure to enter the tracking number without spaces at beginning or end. If our shipping confirmation e-mail does not contain a tracking number, please e-mail customer services to check the status of your order if it does not arrive within the specified time.